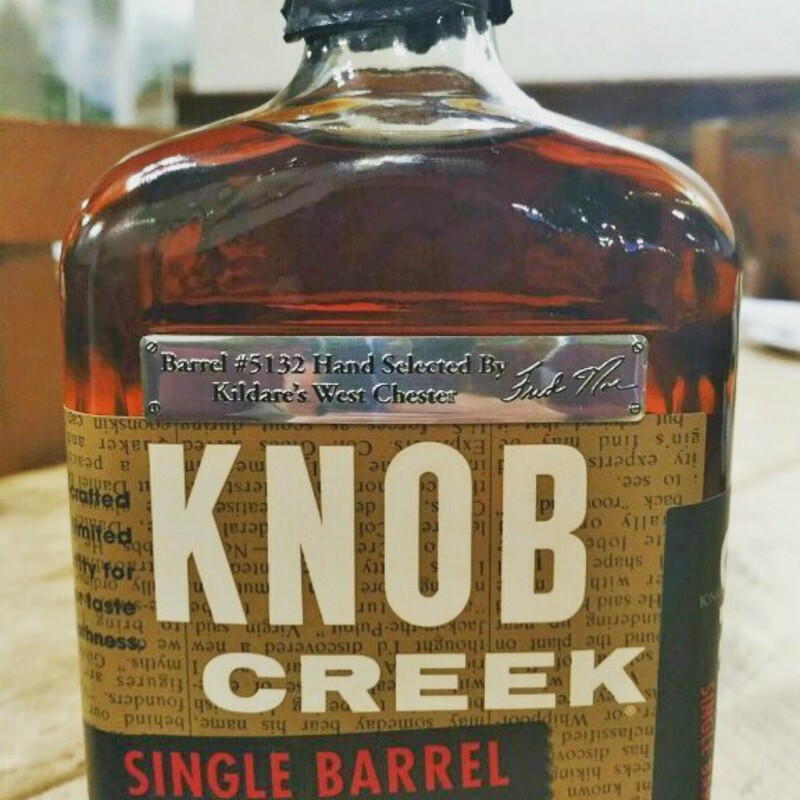 Kildare’s Exclusive Knob Creek Single Barrel Bourbon Whiskey has arrived in West Chester! This past July, members of the Kildare’s team traveled to the Jim Beam distillery in Clermont, Ky., to learn about the history and craftsmanship behind single barrel bourbon whiskey with distiller Booker Noe, the grandson of Jim Beam. During their visit, Kildare’s owner Dane Gray, manager Mark Tarzwell and bartender Colton Luciano did a blind taste test of three whiskies that had been aged in different oak barrels. After testing each one and comparing notes, the three hand-selected barrel #5132 from Warehouse I-4 to become a Kildare’s exclusive whiskey. After the Kildare’s team had tagged its barrel, the distillers at Jim Beam directly transferred the 120 proof whiskey from cask to bottle. The barrel has yielded 108 bottles of exclusive whiskey, and the first batch is available for sipping at Kildare’s of West Chester right now. Along with the first shipment of bottles, Dane also took delivery of oak-aged barrel #5132, which he has dropped off at Levante Brewing Company. The plan is to age a yet-to-be-named beer for an exclusive release at Kildare’s next fall. Kildare’s has over 120 bottles of whiskey available daily — something for everyone. “We have a nice selection, from basic shelf to high end,” Dane stated. “We have Johnnie Walker Blue and Jameson’s Vintage.” Dane also confided that Kildare’s has secured a few bottles of rare Pappy Van Winkle through the latest state lottery. Learn more about its Rare Whiskey Release on January 31.